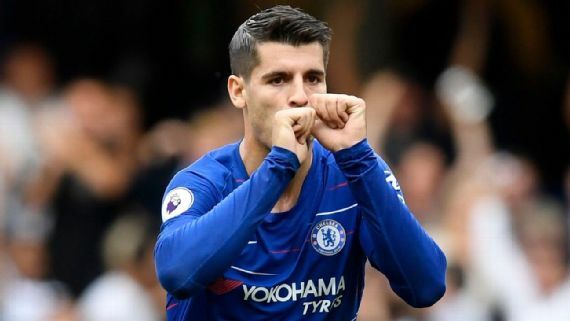 Chelsea striker, Alvaro Morata has blamed former Blues manager, Antonio Conte’s playing style for his underwhelming first season in English football. The Spain international said during Conte’s era, the West London club played direct style of football that affected his performances. According to him, Chelsea’s new manager, Maurizio Sarri’s footballing philosophy suits him better because it allows him and his fellow team mates to hold the ball, pass and create chances. Morata scored just three times in his final 23 appearances of last campaign. The 25-year-old was heavily linked with a move away from the West London club this summer, but he is now confident that they can win trophies under Sarri. “For me, it’s easy. I could have gone back to Spain or Italy, all the people believe in me there, but I want to change things here,” Sky Sport quoted Morata as saying. “I want to, not for all the haters, but for me and for Chelsea. Chelsea gave me everything that I needed and now I have time to give back all that Chelsea give me. “The most important thing is the way we play. Last season it was direct balls and for me to protect the ball in the air is not my best quality. Now I can attack the space, I can play one touch and go in the area for the crosses. It’s better for me. Morata scored his first goal of the season in Chelsea’s 3-2 victory over Arsenal on Saturday in the Premier League.